The flower buds of Daphne genkwa Sieb. et Zucc. of family Thymelaeaceae. Mainly in Anhui, Jiangsu and Zhejiang provinces, etc. of China. Collected in spring before blossom. Light smell, sweet and slightly pungent taste. Flower bud in lilac or grayish purple without impurity. Bitter, pungent, warm, toxic; large intestine, lung, and kidney meridians entered. Drive out accumulated water, kill parasites and cure wound in topical application. 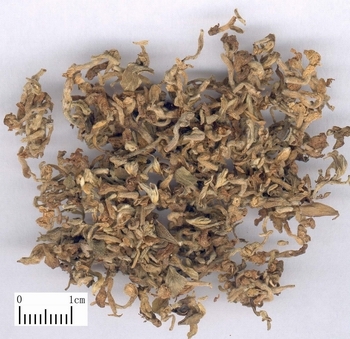 It has a similar but less drastic action compared with Gan Sui and Jing Da Ji, and is often combined with those two herbs to reinforce one another, as in Shi Zao Tang from Shang Han Lun. Because of the combined action of dispelling phlegm to relieve cough, it excels in discharging hydrothorax, especially in treating cough and asthma with profuse sputum and pain of chest and hypochondrium. It can kill parasites and cure wound when being used topically. For scalp infection, neurodermatitis and abscess, its fine powder is used alone or mixed with realgar powder and lard to make an ointment for topical application. 1.5~3 g used in decoction; 0.6 g used in powder or pill. Proper dosage is for topical administration. It should be processed with vinegar to weaken its toxins when taking orally.